WAITING times at the Gibraltarian border have peaked today after severe delays over the previous few weeks. The Gibraltar Olive Press has received reports that vehicles have been forced to wait for up to three hours and those on foot have been held by an hour at customs. Queues lasting for three hours were also reported on November 10 while delays of over an hour have been reported on a number of afternoons over the previous month. Increased waiting times at the Gibraltarian border have been slammed by the Mayor of La Linea. “The queues do not make sense and only generate more opposition among Gibraltarians to any Spanish offers of co-sovereignty,” said Michael Netto, spokesperson for the Cross Border Group in Gibraltar. The situation was also described as ‘shameful’ by the Asociación de la Pequeña y Mediana empresa de La Línea (Apymell), who represent the business interests of La Linea residents in Gibraltar. It is estimated that 13,000 residents of La Linea cross the border every day to work in Gibraltar. 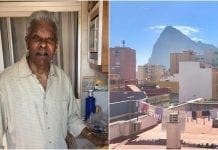 A Gibraltarian government figure told the Olive Press he believed the obstructions resulted from the Spanish authorities trying to impose their authority on the Rock following unrest in Catalunya.